Malian superstars Amadou Bagayoko (guitar and vocals) and Mariam Doumbia (vocals) are releasing their first ever remix compilation and this calls for a little celebration. The fourteen-track album was released on December 20 in Europe and will be out in the US on January 10 2011. It features tracks from their best-selling albums Welcome to Mali and Dimanche à Bamako with several new versions and some previously unreleased mixes from across their catalogue. 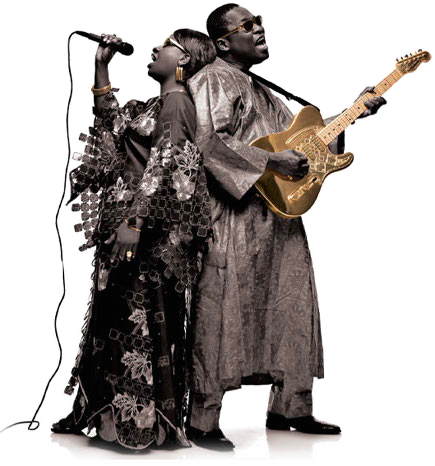 Amadou & Mariam are currently working on their new album, which will feature Santigold and the Nick Zinner from Yeah Yeah Yeahs… As a bonus, here’s an older edit of “Sabali” by UK producer Paul Epworth. j’aimais plus trop sabali, trop passée à la radio mais là en remix ça rend trop bien !